VATICAN CITY (CNS) — As 2017 was drawing to a close, the horrors of war and people’s yearnings for peace were on Pope Francis’ mind and in his prayers. In an unusual move late Dec. 30, the pope had the Vatican press office and Vatican media distribute a copy of a famous photograph from the aftermath of the atomic bombing of Nagasaki. 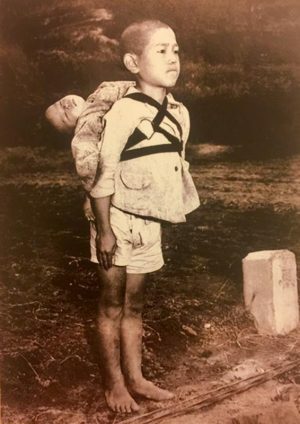 The photo shows a young boy, about 10 years old, carrying his dead little brother on his back. The boy is taking his brother to be cremated. On the back of the card, Pope Francis wrote, “The fruit of war” and signed his name. Below his signature, the pope explained that the photo was taken by U.S. Marine Corps photographer Joseph Roger O’Donnell. After the bombs were dropped on Hiroshima and Nagasaki in 1945, O’Donnell was assigned to document the scenes. “The sadness of the child is expressed only by his lips, bitten and oozing blood,” the pope wrote. The Vatican newspaper, L’Osservatore Romano, printed a copy of the photograph and pope’s explanation on the back page of its edition for Jan. 1, the Catholic Church’s World Peace Day.